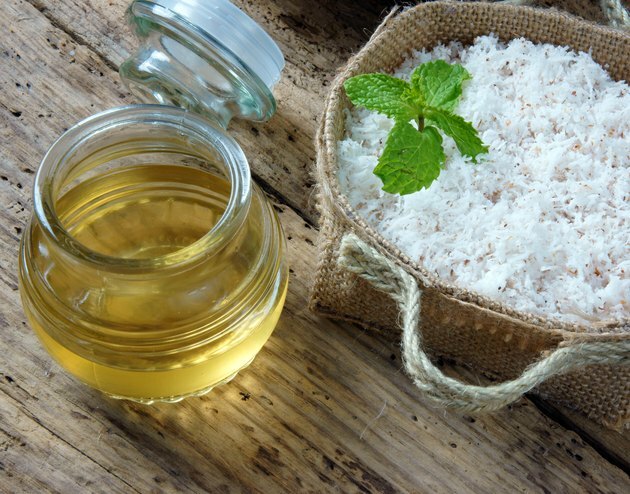 While olive and canola oil often steal the show in terms of healthy fats, you might be overlooking coconut oil as a healthful option. Despite its high saturated fat content, coconut oil has made headway by offering a number of health benefits. Additionally, although coconut oil doesn't lose its nutritional value when heated, it can become unhealthy if heated above its smoke point. Too much saturated fat can raise your levels of cholesterol, which may make coconut oil seem like a poor dietary choice. However, coconut oil appears to have a much greater effect on bumping up your levels of HDL, or good cholesterol, as opposed to bad LDL cholesterol, according to Walter C. Willett, M.D., of Harvard School of Public Health. Additionally, your body uses medium-chain triglycerides, the type of fat found in coconut oil, slightly differently than other saturated fats, as they're processed more efficiently for energy, rather than being stored, notes nutritionist Dr. Jonny Bowden. Different oils have different smoke points. When you heat an oil past its smoke point, the structure of the fats start to break down -- a process known as denaturing. This can cause the formation of harmful free radicals and is the point at which the oil will lose its nutritional benefit. Free radicals cause oxidative damage to cells, which can prevent the cells from functioning normally, increase nerve cell injury and possibly contribute to disease and illness. One claim often made is that all saturated fats tend to have higher smoke points, according to dietitian Kara Landau, but this isn't necessarily true. While coconut does have a smoke point of around 350 degrees Fahrenheit, macadamia, extra virgin olive, almond, hazelnut, peanut, sunflower and avocado oils all have higher smoke points and are all unsaturated, potentially making them just as good for cooking. While coconut oil may appear to be a relatively stable fat, it may still start to denature if you heat it above its smoke point. When using it to saute vegetables, keep a close eye on it to ensure it doesn't start smoking and use in baking or roasting only at temperatures less than its smoke point of 350 degrees. Additionally, though coconut oil may have potential benefits, it is still high in fat and calories, so should be eaten in moderation. Jonny Bowden: Coconut Oil for Weight Loss? Is Coconut Oil Better for Health Than Ghee?